"A recipe inspired from a local brunch restaurant. The Boursin® cheese gives the omelet an incredible creaminess. A great brunch/breakfast dish. I prefer a blend of exotic mushrooms and I like to serve this with toast." Heat olive oil in a skillet over medium heat; cook and stir mushrooms, onion, and garlic until onion is browned, about 15 minutes. Season with Italian seasoning. Beat eggs with garlic and herb cheese spread in a bowl. Mixture will be slightly chunky. Season with salt and black pepper. 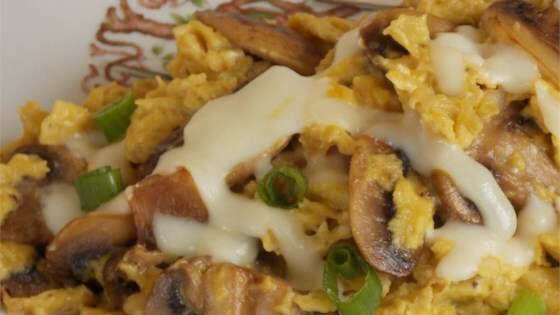 Pour eggs in skillet over mushroom mixture; cook and stir until eggs are nearly set, about 1 minute. Fold mozzarella cheese into eggs until just melted, about 30 seconds. If using cream cheese instead of Boursin® you may want to add more garlic to make up for the lack of seasoning. I have also used heavy cream as a replacement before, with good results. What a great recipe. I had double everything except for the Italian seasoning (mistake on my part). Will be doing again. Thank you boonu for a wonderful recipe. We added goat cheese instead of Boursin, and it was delicious. We will add fresh spinach next time. This was so good as well as being easy to make. I also served it on toast and it was enjoyed. I will make again!